Alpha Cook: More Ice Cream? Udderly Delicious. More Ice Cream? Udderly Delicious. Typically when it comes to milkshakes I acknowledge the existence of only one flavor: chocolate. It’s not something I have to think about; there is never any inner turmoil about whether or not I should try something new. Chocolate is the only flavor. From what I can remember, there has only ever been one exception; only one place from which I have ever ordered a milkshake that wasn’t solely chocolate, and thankfully it will be thousands of miles away by the end of the month. My body can’t handle two or three shakes a week—sad but true. I will warn you now, once you’ve had one, you’re done for. 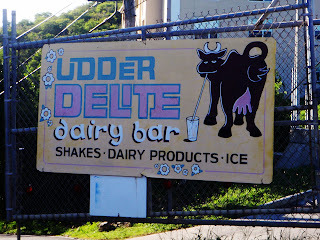 Coming up the road from Magen’s Bay after a long day at the beach, no matter what shape you’re in, you’ll want to stop at the Udder Delite dairy bar. It won’t matter if you’re sunburned, exhausted, or had too many beers with lunch (or for lunch), you will catch a glimpse of that happy cow sign and start salivating. My favorite is the Choc Bun Bun, made with banana ice cream, chocolate milk, and chocolate syrup. The only downside is the occasional chunk of banana that will clog your straw and slow down slurping progress, but maybe that’s for the best. I like it so much that I never want to try any of the others on the menu, so I can only recommend one other milkshake from personal experience. The Jacoco, made with coconut ice cream, chocolate ice cream, and Kahlua, is also tasty. 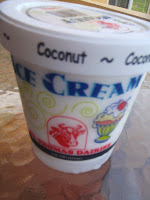 Aside from perfect milkshakes, Udder Delite also sells ice cream from the St. Thomas Dairy, as well as butter, cheese, milk and juice. I say go for a pint of the coconut ice cream—it’s super creamy, rich, and magical. So I bid thee a bittersweet farewell, Udder Delite. You made my swim trunks appear to shrink a size.